University Oval, Dunedin, New Zealand. New Zealand edged a gutsy Scottish display to take a 3-wicket victory in a low scoring game in Dunedin for the sixth instalment to this year's cricket World Cup. The hosts won the toss and elected to field first, as the sun beat down in a beautiful day in Dunedin. Within moments, Scotland would be forced to manoeuvre lethal waves coming in the form of Trent Boult, and then Tim Southee. After a scoreless, tight first over, Trent Boult was unleashed on the helpless Scots, adding plenty of length to his delivery in which McLeod was in line leaving the umpire to undubitably call the wicket. He would come close to a hat-trick as he bowled similarly to the first dismissal and another LBW was claimed. Had McCullum not dropped the ball, he would have taken the second hat-trick of the tournament. With the Brits up against the ropes, Matt Machan made things look less worse with a crisp boundary, but the swing applied from the Kiwis' bowlers was proving a factor. In the fifth over, Scotland were again pushed to the verge of a capitulation, as Tim Southee got in on the act. Coetzer attempted to flick his delivery towards the boundary only for a sharp catch to take him out, then skipper Mommsen was trapped in front of the wicket leaving the umpire to raise his finger, as they fell to 12/4. As the overs went on, the game remained slow but Scotland, albeit dangerously, kept some pieces from falling apart. Berrington and Machan were struggling to open up to the lethal tandem of Southee and Boult, but they found their way. Soon after the halfway mark of the innings, Matt Machan raised his bat as he reached 50 runs, while the whole total shifted to triple-digits. While they made strides to stabilise themselves, a dismissal to Matt Machan in the 28th over with a short ball by Anderson would reduce to 110/5. The wrath of Corey Anderson was then felt again, this time taking out the other part to that 97-run partnership, Berrington. After he reached a half-century, he tried to slog the ball out of the University Oval, but it was an easy catch for New Zealand's sixth wicket. Some 4 overs down the line, Corey Anderson would yet again take jubilation on the field. This time he out-foxed Cross as the ball was swallowed up by the keeper after a thick edge. Things were looking much worse—while not as bad as they did from the start—but at 133/7 more trouble was in store. Daniel Vettori joined what was becoming an incredibly straight-forward end to the innings. The spinner got the better of Taylor who looked to dance down his line to take it out of the park, but an alert Ronchi hit the stumps on the first time of asking. After the batting power-play was introduced, Vettori's second over would end the game. Back-to-back wickets would spell an abrupt end to Scotland's total, with just 142 asked of the co-hosts. Scotland were overwhelmed by the quality of the bowling while they were poor in most aspects also. With an apparently simplistic total to chase, Martin Guptill hit a boundary to open the first over, before stepping up the intensity in the second, as the Kiwis looked to wrap things up early. However, Wardlaw would stun the hosts' opener as he went for another glamorous shot only to be caught by Cross. Brendon McCullum, who shined against Sri Lanka, looked to do the same against his counter-parts but after hitting a cluster of boundaries alongside Williamson, he would be stunned as Wardlaw picked another wicket as the skipper tried to guide it on for a boundary but edged it straight into the keeper. After 7 overs, New Zealand had climbed to 48 runs, but at the expense of 2 wickets. Due to the fast-pace of the first innings, a lunch break was allotted before spinner Majid Haq eliminated Ross Taylor in his first over. Taylor attempted to hoof the ball out for six, but it dropped out of the air for another Taylor to catch the ball for Scotland's fifth wicket of the game. While New Zealand continued to close in on their target, Josh Davey preserved some hopes with two wickets in his over. He first got rid of Anderson as Gardiner made the catch, then his fellow prolific bowler Wardlaw made the catch to get rid of Anderson. With Daniel Vettori now on the crease, he notched the boundary as New Zealand won by three wickets. Did we ever expect Scotland to be able to put up a fight after the early 4 wickets conceded? Not only did that crucial 97-run partnership hoist them to more respectability, but the bowling made for some late jitters. It could've been complacency, or it could be the character of this Scotland cricket team. They continued to fight even at the death and on another day would have been even closer potentially on the verge of victory. Considering their high-standards and the bar they had set prior to the sixth World Cup game, New Zealand, understandably, will want to improve knowing that on their finer days they may have only dropped a wicket or two on the run chase. As for the Britons, picking themselves up from a woeful start will tell a lot of what is to come in their future. They can take a plethora of positives from this game. For both teams, up next is a game with England. A side reeling after being demolished by the Aussies, it's the perfect time for New Zealand to further solidify dominance and for Scotland to get going. New Zealand continue to soar in their World Cup campaign on home soil, but after this display, how far can Scotland go? 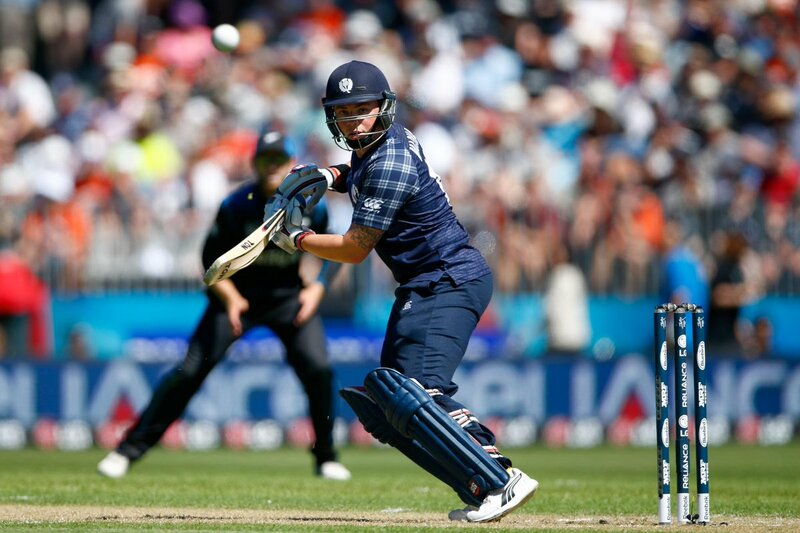 New Zealand overcome a courageous Scotland in the sixth game of the 2015 ICC Cricket World Cup.